See Mary Pauline Callender, author of the Marjorie May menarche booklets for girls. From the very early days of advertising for menstrual pads and tampons, sellers used women, fictional perhaps, to pitch their products. Can you imagine a man, pad in hand, advising women to use them? (Actually, some have, like here.) Even though a man probably invented the first modern commercial menstruation napkin, and certainly did the first commercial tampon with an applicator, women could better trust another woman to understand the problems of their "critical days." "Critical days," by the way, an expression used in several cultures, will get a separate section of this site in the future. 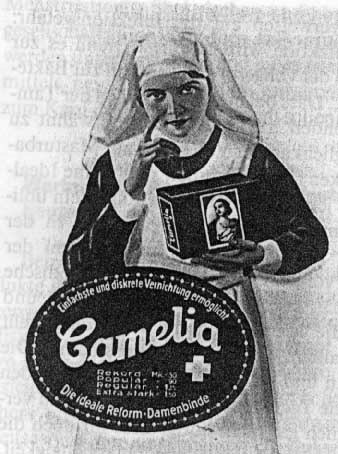 The German Camelia menstrual-pad people use it in a pre-World War II ad. See also Mary Pauline Callender, author of the Marjorie May menarche booklets for girls. Below we have two early appearances of the woman-to-woman approach, even though I suspect these, and later, women may have been speaking with a male voice. Men run the industry, after all. If alive, will the real Mrs. Barton and Nurse Thekla out themselves? Left: Mrs. Barton advised readers to buy Fems through her booklet "Personal Daintiness," here in an ad from McCall's magazine, September 1921. (Decades later, Sears portrayed a figure also called Barton to lend her name to menstrual gear.) Astute site visitors recall that Kotex started advertising its disposable napkin in January 1921. Even more astute visitors know that Kimberly-Clark (which Marjorie May's mother spoke for) sold a product called Fems decades later, and that a certain Ann Barton popped up in Sears catalogs at the same time, sweet-talking readers into buying her pads. Is there a Fems-to-the-left connection with Kimberly-Clark? And could the Barton-to-the-left be the mother of the Sears Barton? Folks, this is drama! Let's assume that an ad man invented Mrs. Barton. Why Barton? I wonder if the public still remembered Clara Barton, founder of the American Red Cross? This would make the medical connection in people's minds; nurses, you will remember, used bandages the Kimberly-Clark Company made for soldiers in World War I as menstrual pads, giving birth to Kotex. Manufacturers loved, and love, to use medical authority, as we will see in the Camelia ad below, from Germany, where people respected it even more. The Camelia ad is below. Many thanks to Professor Domenico Pecorari, Director of Obstetrics and Gynecology, Policlinic Hospital of the Medical School, University of Verona, Italy, for sending me the valuable article "Befleckte Weiblichkeit - Spuren tradierter Menstruationsmythen in der Werbung für Produkte der weiblichen intimhygiene," by Dr. med. Jael Backe of the Universitätsfrauenklinik Würzburg, Germany, published in Gynäkologisch-geburtshilfliche Rundschau 1997; 37:30-38. The above Camelia ad came from that article. Kotex and other companies used the cross - note again the connection between medicine and the Christian development of hospitals - on its boxes and in advertising. This encouraged the connection between sickness and menstruation in the public mind, as well as the authority of doctors and nurses. And did it - Good Grief! - subliminally suggest that it was the Christian thing to use? Anyway, the words above Camelia translate as "Enables simplest and discrete destruction." A woman who bought Camelia found a slip of paper in the box. When she needed more pads, she silently handed the slip to a store clerk; signs in drug stores advised women to ask for a female clerk when buying Camelia. The slip said, "Please sell me a box of Camelia." American women buying Modess pads could also present a slip to clerks they clipped from ads. See Mary Pauline Callender's Marjorie May menarche booklets for girls.